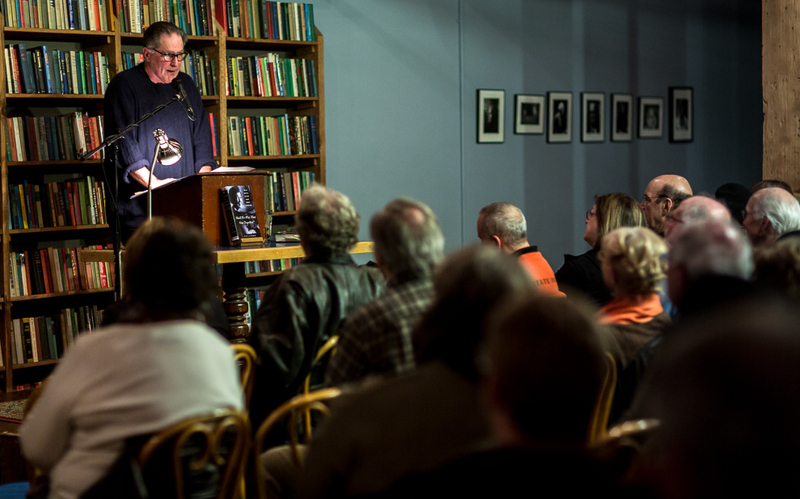 At a packed reading at Elliot Bay Books on Friday night, acclaimed Seattle journalist Paul de Barros presented his just-published book Shall We Play That One Together? : The Life and Art of Jazz Piano Legend Marian McPartland. In a world dominated by men, Marian McPartland distinguished herself as one of the greatest jazz pianists of her age. Creating more than a biography in Shall We Play That One Together?, de Barros chronicles a vital age in jazz, drawing on innumerable interviews and unrestricted access to McPartland’s personal archives. Born in the UK as Margaret Marian Turner, Marian McPartland learned to play classical piano but was passionately attracted to the rhythms of American jazz. Entertaining troops in WWII Europe, she met her future husband, Jimmy McPartland, a cocky young trumpet player who was the protege of the great Bix Beiderbecke. They were married and, together, they made jazz history. At first, Marian played second fiddle to Jimmy in Chicago, but when they moved to New York, Marian and her trio took up residence at the famous Hickory House, where she thrilled the crowds from her perch on a stage in the middle of large oval bar. From there she went on to triumphs at places like the Montreaux Jazz Festival. Possibly, her greatest accomplishment was the creation of NPR’s long-running show Piano Jazz. De Barros is a music critic for the Seattle Times, a current adjunct professor at Seattle University, a regular contributor to DownBeat magazine and a co-founder of Earshot Jazz. He has written for Musician, Modern Drummer, Antioch Review, Washington Post, Los Angeles Times and the Philadelphia Inquirer. He has also contributed liner notes for Columbia, Fantasy and Verve records. His comprehensive Jackson Street After Hours (Sasquatch, 1993) stands as the definitive history of the early Seattle jazz scene and won the Washington State Book Award (formerly, the Governor’s Writers Award) in 1994.